The overall philosophy of Blue Ocean Strategy is to make your competition irrelevant by creating a new market space for yourself. The question here is whether this philosophy can be applied to you as a fresh graduate. Can it help you make your competition irrelevant? Each year thousands of graduates are churned out of universities creating a sea of “bloody” competition – a “Red Ocean”. How can you adopt Blue Ocean Strategy thinking to land the career of your choice? If we were to sketch an existing “As Is” strategy canvas using the key competing elements mentioned above, to visually describe the two typical candidates, it will probably resemble the chart below. The Strategy Canvas is a visual tool in Blue Ocean Strategy that captures the current state of play in the known market space. This allows you to understand where the competition is currently investing as well as the individual components on which competition is based in the industry in question. Which factors should be created that are currently not part of the industry? In my opinion, the learning factor is already an industry given. Everyone is expected to have a desire for learning. However, when a candidate who is applying for a job, mentions that he is there to learn, I begin to feel a little apprehensive. The sentiment is that we are not hiring you to learn but to contribute! Learning should be an ongoing process irrespective of your position or status in the company. Therefore my advice to new candidates is to stop saying this. Instead you can emphasise your willingness to contribute with the “little” that you have. Obviously when you want to contribute more, you will automatically acquire the knowledge and engage in “on-the- job” learning and training. Many fresh graduates, more often than not, request for salaries above and beyond their current value in the market. In this instance, my advice would be to reduce your salary expectations. I am not suggesting that you to reduce your requested starting salary. Rather, I am advising you to conduct market research and align your salary expectations to standards in the market and industry. One of the biggest disappointments for an employer is dealing with candidates who ask for a high salary because they have achieved a high CGPA. Remember, the CGPA may get you into the interview – but it does not guarantee you the job. There are aspects of your profile that can be improved or enhanced. One of these is your work experience. I understand that as a fresh graduate, you may not have the necessary experience. However, this is an opportunity to differentiate yourself. You need to find creative ways to gain this experience. Internships or apprenticeships are both great ways to achieve this goal. Internship is the best time to learn so you should capitalise on such opportunities. I have had interns telling me that they are willing to work for “free” just to be given the opportunity to work and gain experience during the course of their studies. Whilst most organisations pay interns an allowance, this attitude and hunger to learn at all costs is truly an added advantage. Experience also serves to enhance your domain knowledge especially if you are trained by the relevant organisation during your studies. Other factors that you should focus on are your presentation and communication skills. These are industry imperatives. In a world where ICT has overtaken verbal communication, I realise that fresh graduates may not have the ability to articulate their thoughts, let alone communicate them. One way to improve these skills is to make a video of yourself and critically evaluate it. The video will help you to see and assess your strengths and weakness. Once these are known, you can start to work on improving the weak areas, and practising to enhance your skills. Put your smart phones to good uses. Lastly, you should possess the very important core value of humility. Always have the attitude that you don’t know everything! Learn to respect people. Humility is the best policy. This will indicate to the employer that you are serious about absorbing and wanting to “serve” in a greater capacity. This is another key area where you can differentiate yourself. As mentioned earlier, I would create a compelling tagline stating that you are here to give! This will allow the employer to see that you have a different mindset; that of wanting to contribute and add value to the organisation. Secondly, work on polishing skills like problem solving, critical thinking, and content and knowledge creation. This is not an exhaustive list, but these are rare skills in new candidates. By doing these things, you will demonstrate your versatility and show that you are armed with multiple capabilities. You can acquire these skills by reading books on the various subjects. Alternatively, you may seek a capable mentor from the industry who can impart these skills to you. You can also look within your family or circle of friends and ask someone to become your mentor! You can offer to do housework or chores for them in return for their time and effort. Your hunger will motivate your mentor. There are many other elements that you can create for yourself. You can research the specific industry for further information, or add on to those that are mentioned in the quadrant in this article. 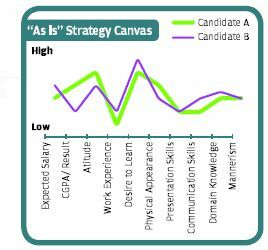 Your new “To Be” strategy canvas could look like the “I Am Here To Give” diagram, with a value curve that sets you apart from the rest (Candidate C). I have used a hypothetical ERRC here, but try it with your own scenario and create a Blue Ocean for yourself. Start applying the ERRC framework and stand out in a sea of candidates! ← What is the wildcard of Malaysian GDP growth going forward?